The Refined Geek » Shadow Warrior: The Wang is Back. Shadow Warrior: The Wang is Back. Reviving old IPs has proved to be something of a double edged sword. There’s definitely a lot of demand out there as many successful Kickstarter campaigns have shown but the resulting games have always been something of a mixed bag. For the most part the ones that simply try to recreate the old game with modern technology tend to fair worse whilst those that actually attempt a faithful reboot using the world and characters fair a lot better. This was the difference between Rise of the Triad and Tomb Raider for me, although the latter’s budget probably had a lot to do with it. So you can imagine when I saw a Shadow Warrior reboot I was hesistant to try it out for fear that it would have been yet another straight port, even if came with Lo Wang’s signature tongue-in-cheek humour. You are Lo Wang, general badass and agent to the Zilla corporation, working directly with the company’s head doing whatever is required. Your first mission is simple, offer up $2 million in exchange for a single sword and bring it back. The deal, predictably, goes south and after dispatching numerous guards you find yourself confronted with another foe: demons from the shadow realm. As it turns out that sword you were sent to retrieve was none other than the Nobitsura Kage, an ancient katana which is the only weapon that can destroy beings from the shadow realm. 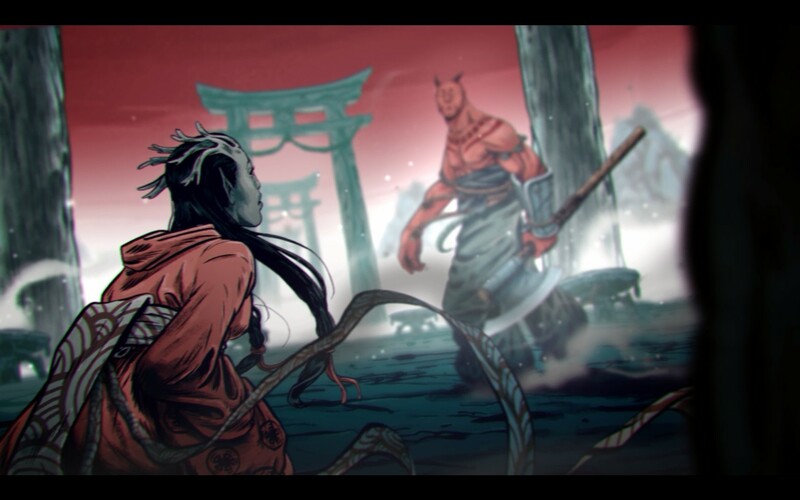 Guided by your new demon friend Hoji you’re sent on a quest to retrieve all the pieces in the hope that you can stop the unrelenting demon invasion. Of course not everything is as it appears and Zilla’s intentions are far from being that of a simple collector. 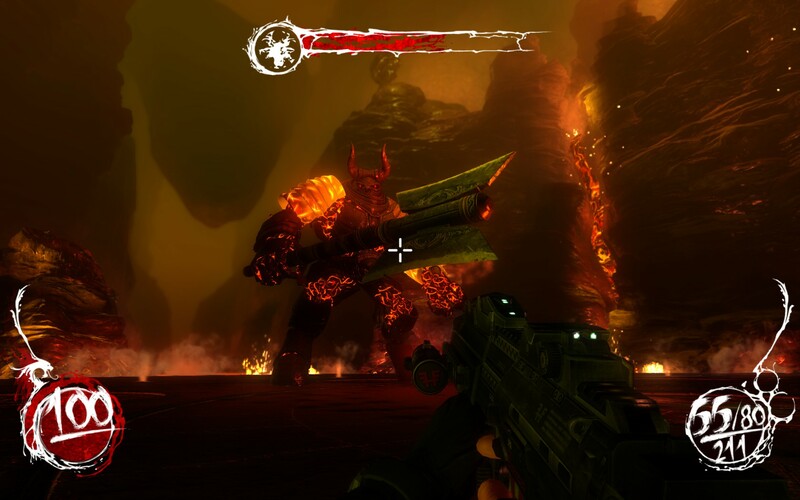 All aspects of Shadow Warrior have been tuned for fast paced, hack ‘n’ slash combat, including the graphics. If I’m honest they’re at the level I would have expected from a cross platform release however with Shadow Warrior being a PC exclusive that excuse doesn’t hold up unfortunately. It’s not that they’re bad or dated, indeed as some of my selected screenshots will attest to it can be quite pretty at times, but apart from those set pieces it definitely has not been designed for you to gawk at. Combine this with a healthy dose of asset reuse that you’ll see throughout the game (which includes everything from the treasure chests to whole sections of levels) says to me that the graphics weren’t the highest priority but they do serve the purpose well, even if it gets a little samey as the game goes on. Shadow Warrior is a first person hack ‘n’ slasher, throwing hordes of enemies at you which you can dispatch in numerous ways. Your primary weapon in nearly all of these encounters will be your katana as only it has the clearing power required to churn through enemies fast enough. There’s a ton of other weapons available all of which are made available to you a various sections in the game and you’re not likely to be wanting for ammo thanks to it being strewn everywhere. However chances are if you can get within melee range of your enemies you’ll want to use the katana over everything else thanks to the synergy it has with the other primary combat mechanic: dark powers. There are 3 separate upgrade systems in Shadow warrior, each having their own unique upgrade currency and all of them affecting different aspects of the game. The primary upgrade system, or at least the one you’ll be using the most often, is the karma system which is levelled up by defeating enemies. Using special abilities and varying your approach will also net you karma bonuses, allowing you to attain upgrades quicker. The skills you get in this tree are augments to your other powers as well as direct stats boosts which can be your saving grace in the middle of a giant firefight. 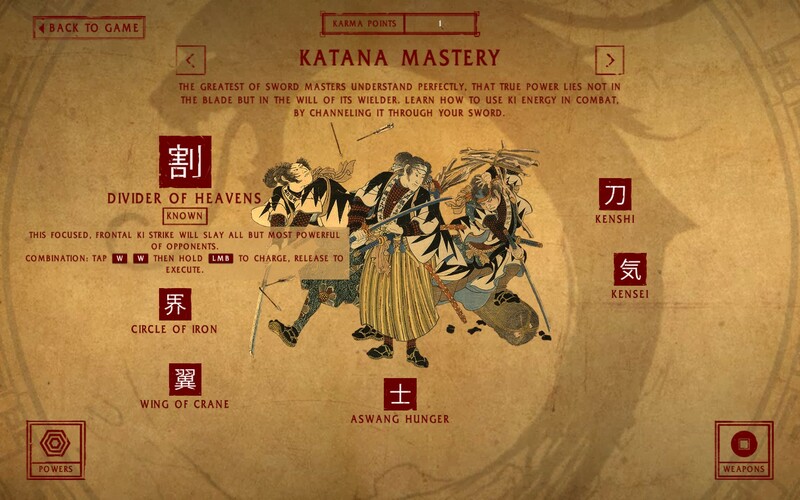 There are also some unique abilities available which can radically change how you play the game although, in all honesty, you’re crazy if you don’t focus everything on the katana and the skills surrounding it, especially the life stealing abilities. The other 2 upgrade systems focus on dark powers (upgraded through Ki Crystals of which there are usually 1~2 per chapter) and weapons (which use money). The dark powers system feels like an organic progression mechanic more than anything else as the upgrades come regularly and predictably and, past a certain point, don’t heavily influence the game play. Your initial choices will heavily influence your choices down the line however as it’s pretty clear that you can either favor an offensive or defensive style. Weapon upgrades are probably the least influential out of any of them since the katana is just so much more powerful by comparison except when it comes to the boss fights. Thus I usually found myself with a horde of cash up until I got to a point where I felt a certain weapon needed upgrading to help me out. It’s also worth noting that whilst the katana appears in this menu you will never be able to upgrade it using money, so don’t bother waiting for the unlocks to happen. All of this combines into a combat system that is fast paced and utterly enjoyable. You’ll start off with small engagements with only a handful of enemies but it will slowly ramp up to the point where you won’t be able to remember how many enemies are on the field. Over time new enemies get thrown into the mix, including giant warlords, warlocks that raise the dead and beasts covered in metal that can only be taken from behind (snicker). Unfortunately it does start to wear on you towards the end because the only way the difficulty increases is by adding extra enemies or reducing the amount of space you have to move around in. Additionally a lot of the cool abilities you unlock will simply not work on the higher tier enemies which kind of makes them pointless, making you reliant on the one move which does the most damage. Despite this the boss fights are probably the strongest aspect of Shadow Warrior as whilst each encounter uses the same mechanic for defeating them (shoot the glowy bits until the fall down then kill the crystal inside) they each have unique abilities and all of them are just epic in scale. They can be a tad frustrating as there are some one hit kill mechanics and the checkpoint system doesn’t always save at critical points but honestly that was only a big issue with one of them. The rest were a hell of a lot of fun as you spam all your weapons at them to bring them down and nothing can beat the exhilaration you get after you’ve spent 30 minutes circle strafing your way to victory. Shadow Warrior unfortunately suffers from a few notable glitches as well as having some outright game crashes that happen without warning. 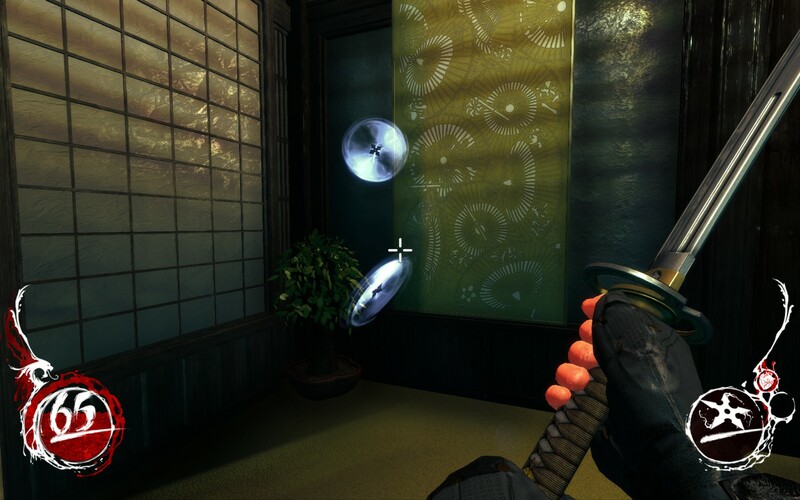 The screenshot below shows how shurikens will sometimes just float around in space forever. This usually isn’t an issue however I sometimes heard the shuriken noise coming from behind walls which, for a game that uses sound cues for certain things, can be quite distracting. I also experienced game crashes twice which I can directly attribute to some unknown edge case in ability use as they both happened instantly after I used an ability (circle of iron was the last one I could remember and it happened right after I released it). Key press recognition also seems a little flakey when you start to get dozens of enemies on screen which can be a little frustrating when you’re trying to heal yourself or trying to clear a path so you have some breathing room. Of course it wouldn’t be Shadow Warrior if it didn’t have signature style of humour including numerous Wang jokes as well as other tongue-in-cheek humour. Thankfully, unlike other titles that tried to use similar humour techniques, it doesn’t get overplayed at every opportunity. Sure you’ll hear the same jokes every so often but it at least doesn’t scream “HEY WE’RE FUNNY RIGHT? YEAH WE TOTALLY ARE” desperately, hoping you’ll give them some laughs out of sympathy. This then flows onto the story which, admittedly, isn’t anything to write home about but surprisingly is far above what I expected. I guess I was somewhat let down by Rise of the Triad (which was more of a direct remake of the original than anything) and thought Shadow Warrior would be the same but it’s so much better. Whilst the shift in tone towards the end comes at the cost of the humour it does help to round out the story well and thankfully avoids the pitfalls of screaming for a sequel. 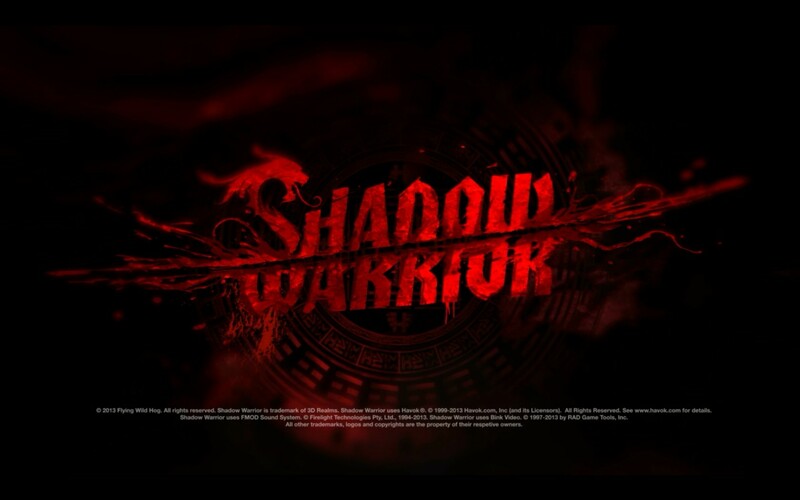 Overall it’s not the dramatic story telling experience that you might expect from some games but then again you’re not playing Shadow Warrior for that, you’re playing it for the fast action and wang jokes. 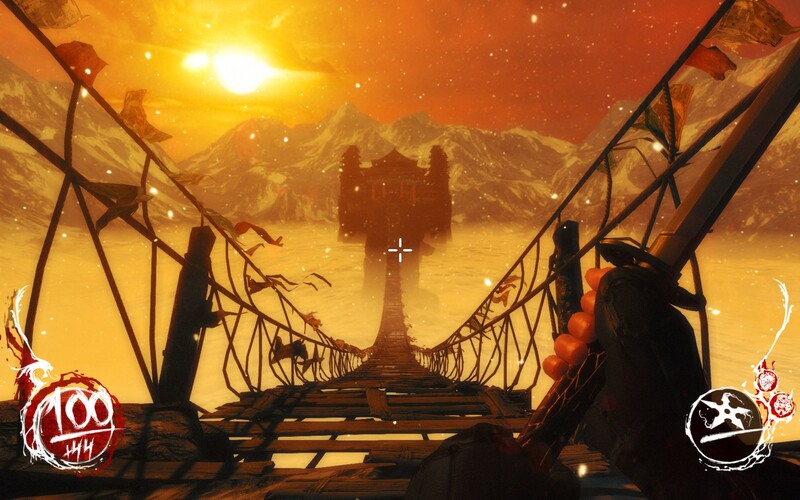 Shadow Warrior is a shining example of what a reboot can do to an old IP. Instead of trying to recreate the past exactly with modern tools Shadow Warrior is instead a homage to the title of yesteryear, one that takes all the things we loved about it and bundles them up in a completely new game experience. It’s not without its faults, especially with the rudimentary challenge scaling and game crashes, but I’m hopeful that the latter will be fixed in future patches. For me Shadow Warrior is the standard to which I’ll hold future remakes as it’s faithful to the original IP without relying on nostalgia to drive it. Fans of Wang should definitely check this out. Shadow Warrior is available on PC right now for $39.99. Game was played on the Hard difficulty with 10 hours total playtime and 59% of the achievements unlocked. Pingback: The Refined Geek » Shadow Warrior 2: You Mess With the Bull, You Get the Wang.